Sprinkle chicken with garlic salt and ginger. In a large non-stick skillet coated with cooking spray, brown chicken in oil. Drain pineapple, reserving 1/4 cup of the juice. 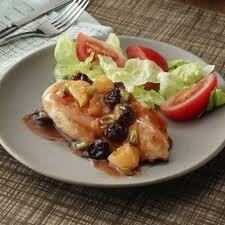 In a small bowl, combine the sauce, cherries and reserved juice; pour over chicken. Bring to a boil. Reduce heat, cover and simmer for 8 to 10 minutes or until a meat thermometer reads 170 degrees; turning chicken once. Stir in pineapple and onions; heat through. Vicki’s Note: We have never had a bad meal at Evelyn’s!!!! She is an excellent cook! 🙂 She recently served this to us for my Birthday Dinner. Served with fluffy white rice and a yummy dessert…”Easy Strawberry Cream Dessert Squares” which I will also post. Mouthwatering!